The options for designing amazing treehouses are virtually limitless. But whilst many radical designs may be stunning, they are not necessarily trends we predict are here to stay. We look at some of the design features that we think will continue to characterise homely and amazing treehouses. Strictly speaking, a treehouse is a fairly simple concept. It’s a house in a tree! Though the ontology of it doesn’t leave much room for imagination, the design is quite the opposite. Treehouses are so much more than the term may initially seem to to imply. Treehouses are both basic and infinitely complex. Whilst the basic ingredients are always the same: a tree and some sort of dwelling perched in or around it, the way this concept is realised is quite literally limited only by the imagination. From barely-there mirrorcubes hovering ghost-like among the treetops to larger-than-life birds nests, there are few other areas of design that have come so close to making our dreams tangible – and, above all, habitable. 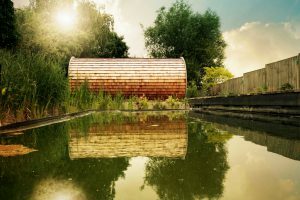 As innovation drives the production of new construction materials and techniques, treehouse designers are continually pushing the boundaries of treehouse design, conceptualising structures that verge on the possible. When we get the chance, at Blue Forest we have a great time trying our hand at some of the more daring designs ourselves. Most of our clients, however, have a preference for treehouses that are a bit less experimental and a lot more experiential. And we tend to agree. A really great treehouse grows quietly from its surroundings, taking its queue from the trees around it, echoing organic elements and using natural materials in its construction. A quality treehouse both captures your attention with its bold design and blends seamlessly into the environment. Some are luxuriously fitted whilst others offer luxury in their simplicity. Though different in their design, all of our treehouses have one unifying trait: they provide experience – whether it’s adventure or sanctuary. How they deliver these experiences is often down to a number of particular design features. 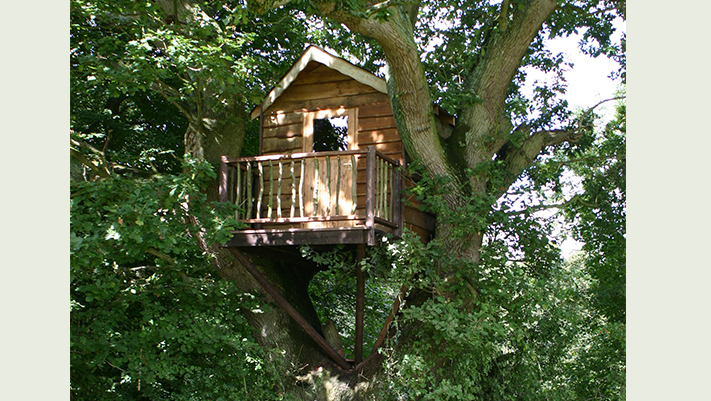 Here we look at a few aspects of treehouse design that add a distinct character to our treehouses. Nothing connects us more to our primal selves than the spectacle of a roaring fire. Whether it’s the smug glow of accomplishment having stacked and lit it yourself, or huddling around with friends and family, fire has a way of bringing us all back to the very basic stuff of life. Adding a firepit to a treehouse is a great way of adding a focal point to an outside deck area. It is a great space for gatherings and when teamed with a treehouse gives a sense of complete self-sufficiency and a return to the simpler things. The Nook Treehouse features a private space enclosed by handrails leading from the treehouse to the outside seating area. The sunken firepit is great for long evenings outside and when the fire has died down, a bit of stargazing. Whilst all of Blue Forest’s treehouses are commissioned by adults, we know we’re really building them for their inner child. That’s why in addition to paying attention to getting all the necessities right, we often like to add a bit of playfulness to the design. A crowsnest adds some height to the treehouse design and an opportunity to scramble up a ladder or rope and enjoy the childlike thrill of looking out over the greenery. Because not all our treehouses are built very far off the ground, a crowsnest is a good way of producing an elevated vantage point. 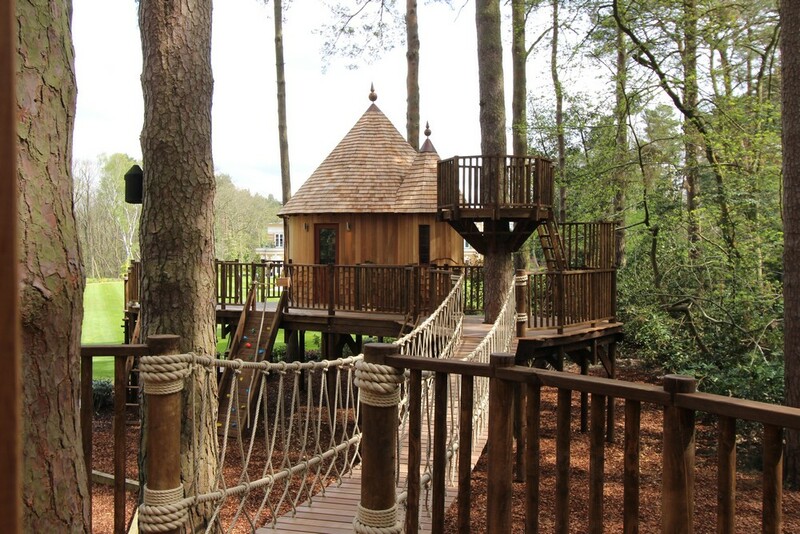 The Enchanted Hideout treehouse actually consists of multiple treehouses joined together by an adventure playground. It has modern facilities, including a play area with home cinema, but also features a crow’s nest from which to look out over the trees. Quietness is fast becoming a rare commodity. Keeping the noise out can be a real challenge. And even behind the windows of double and triple glazed luxury apartments, the buzz of appliances often persists. 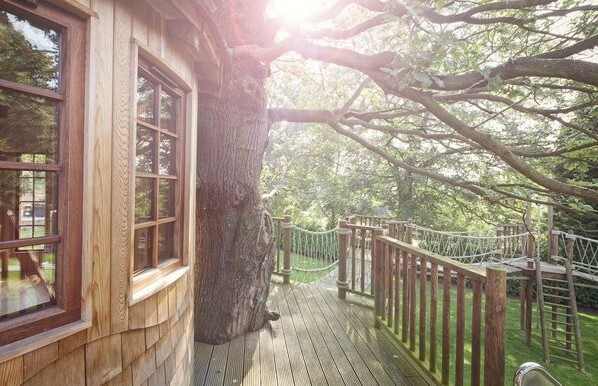 It’s why we got involved in designing and constructing the world’s first Quiet Treehouse. 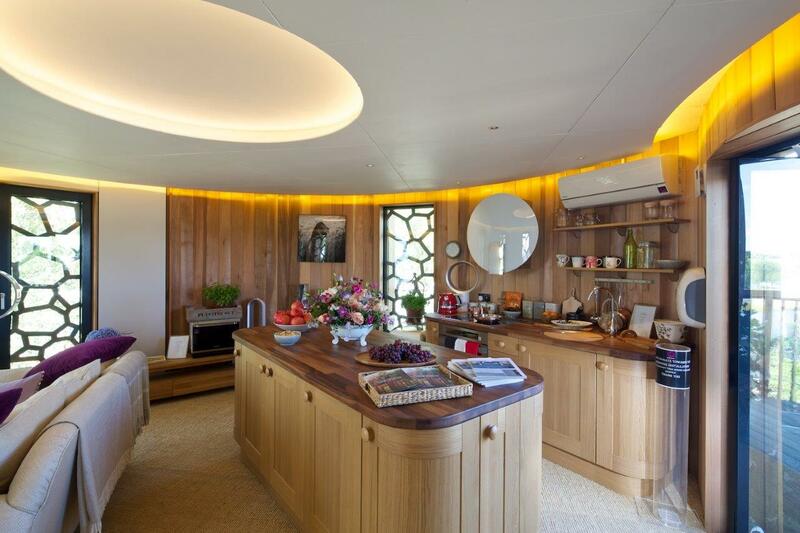 Using pioneering sound insulating materials, the treehouse is unrivalled in its ability to keep sound out. And furnished with Quiet Mark approved technology further ensured the inside stayed serene. Thinking about ways of keeping sound out of treehouses and controlling the amount of sound generated inside it, is a design trend we predict will continue to gain traction. The Quiet Treehouse was built to both keep sound out and produce minimal sound inside. A great deal of Blue Forest’s treehouses are built with multiple uses in mind. 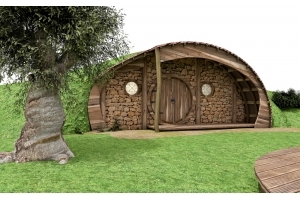 They’re usually expected to both be a place to hide away and to occasionally indulge in a bit of entertainment and technology–essentially the defining features of a real den. If done poorly, however, adding flat screen TVs, access control and other equipment can quickly rob a treehouse of its charm, making it feel suburban and confining. Getting the balance right will continue to be a key consideration in treehouse design. The High Tech Hideaway would make James Bond proud – all the gadgetry that becomes a secret agent, with the understated and inconspicuous elegance of drinks that come shaken, not stirred. Anyone who has tried their own hand at it will know that at least part of the marvel of a childhood treehouse is the haphazard manner in which it comes about. Because you have to rely on the existing tree’s structure, the design has no choice but to respond organically to the tree’s form. This becomes even more the case as over time the tree grows, pulling at the construction and reshaping the treehouse as it goes along. Because our treehouses are built to last many years and we take great care not to damage trees during construction, we rarely build treehouses into or onto the actual tree. The structures are often designed to encompass trees, but the entire process means we are not as dependent on the tree itself to determine the design. This does not mean that the design itself is not responsive to nature though. Our Fibonacci Treehouse emulates one of nature’s most iconic shapes – the golden or logarithmic spiral that represents a ratio at the heart of a multitude of organic forms – from seashells to flowers. Paying homage to nature by emulating its perfect designs in treehouses is likely to be afforded ever more prominence in treehouse design. 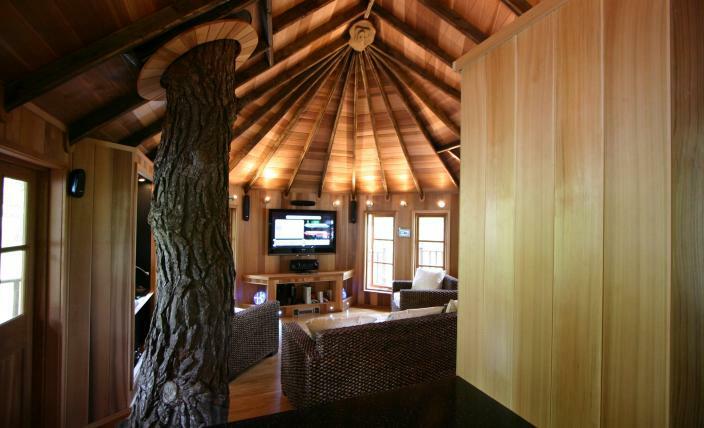 The Fibonacci Treehouse’s curve emulates that of the golden spiral. One wall can be entirely opened to the outside, creating a large free flowing space. Treehouses can be spectacular structures. Some we have built resemble fairytale castles, others stretch out across multiple platforms. Yet there is a distinctive charm about a treehouse design that sticks to the bare minimum. While we do foresee treehouse design continuing to produce innovative new structures, the classic treehouse will remain a favourite. The Bird’s Nest treehouse is a charming, cosy structure nestled in branches of a large tree. Its unpretentious simplicity is the stuff of childhood fantasy and reminds us all of a time when a little was more than enough. What Exactly Is Sustainable Construction And How Is Blue Forest Doing Its Part?